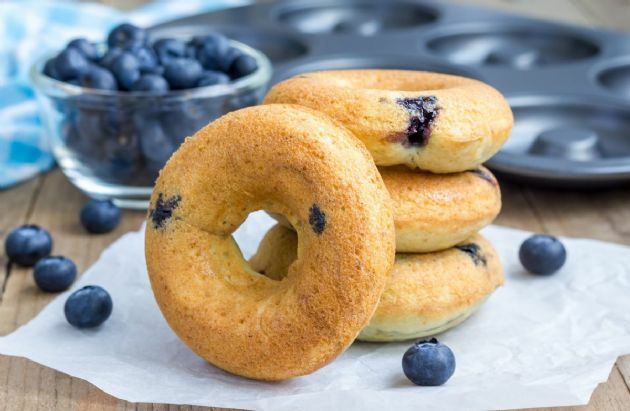 At 300 calories a pop, donuts are an easy way to wreck a healthy breakfast. Not my baked ones. They're bursting with fruit and flavor--not fat! At 300 calories a pop, donuts are an easy way to wreck a healthy breakfast. Not my baked ones. They're bursting with fruit and flavor--not fat! No donut pan? Bake these in muffin tins instead! Like this recipe? You'll love "The SparkPeople Cookbook." Want three sneak-peek recipes? Click here! Combine all dry ingredients in a mixing bowl. Combine all wet ingredients except for blueberries into a separate mixing bowl. Stir the wet ingredients into the dry just until combined, then gently fold in the blueberries. For mini donuts, drop one tablespoon of batter into each donut form. Use two tablespoons for traditional-size donuts. Pulse the sugar and lemon zest in a mini food processor until combined. Place the lemon sugar into a resealable bag. Working with two at a time, place the donuts in the bag and shake well to coat. Transfer the donuts to a wire rack to cool, if they make it that far!